Comment: Obama, what about the Middle East? (CNN) -- Sometimes you say a lot when you say nothing. 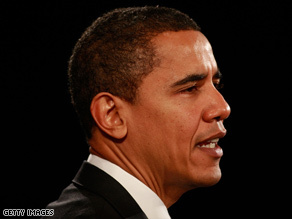 Analysts say President-elect Barack Obama has made little comment on the Gaza-Israel crisis. Listen to Barack Obama. We know his plans on subjects big and small, ranging from a multi-billion-dollar boost for the US economy ("we have to act and act now") to the next White House pet ("we're going to have a big rambunctious dog"). But we don't know if he has a plan to help end the bloodshed in the Middle East. As Israel attacks Gaza in the name of its war on terror, and Palestinians plead for help in the name of decency, Obama has kept his opinions to himself. Instead, he tells reporters that President George W. Bush alone speaks for the United States. "We can't have two administrations running foreign policy at the same time," he said this week. "We simply can't do it." Long before the shooting started, Hamas seemed optimistic about Obama. A senior Hamas figure named Ahmed Yousef said during the US presidential election campaign that Obama held out the prospect of change. It could be that once he's sworn-in, a week from Tuesday, we'll hear Obama speak eloquently and at length about what he wants for Gaza. It could also be that we'll hear relatively little, because Obama knows the old political maxim that to govern is to choose. The president-elect has an enormous job ahead, invigorating America's economy, getting the US army out of Iraq and making good on the countless promises that won him the presidency. Gaza is a profound humanitarian crisis but at the same time a distraction from problems closer to home. Anything which can be construed as support for Hamas, which the US officially designates as a terrorist organization, would be a big change and a challenge for the administration. No president can be uninterested in the Middle East because there is so much at stake. But some presidents have paid more attention to it than others. Keep listening and we'll find out what he chooses.